The Minolta Freedom Zoom 90 on the bottom right is a freebie, and I took it the kids school for two days this week and took several pictures of the kids and their friends at school. I have one more shot left in the camera and the roll is ready to be developed. 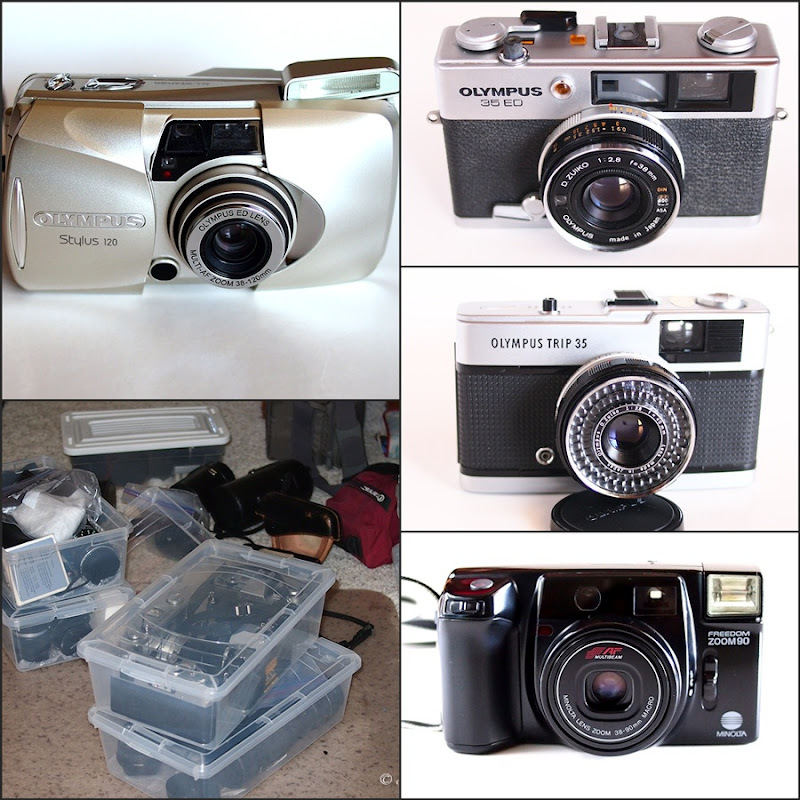 I am really thrilled by the Olympus Stylus 120. I got it for a mere $10 (inclusive of shipping) at a Goodwill auction site. As if that is not enough, I won a bid (I was the only bidder) on an Olympus Stylus Epic Zoom 170 for a mere $15 and that amount includes shipping! A steal, really! 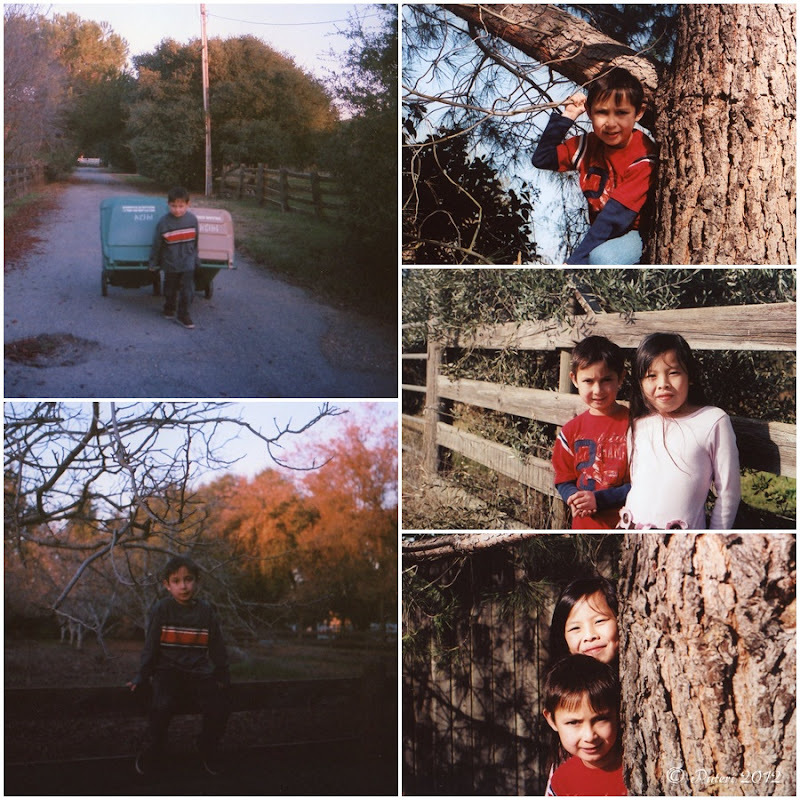 The pictures of the kids on the right side of the collage were taken with Olympus OM-2n. I am really happy with the output of this camera. The pictures of Duncan on the left were taken with Minolta X-370. The pictures taken with that camera were mostly dark, and I suspect that was mostly due to the fact that the majority of the pictures were taken in the shade and the film speed that I used was not that suitable for taking pictures in the shade. The other possibility could be the inaccuracy of the built-in light meter in the camera - due to its age. However, I doubt that is the case because the first roll I took using that camera when I first got it came out ok. I will have to try another roll of film with a higher ISO to be certain. I ordered a good photo scanner last weekend and it arrived on Wednesday. I am really happy with this scanner because it can do a much higher resolution scan than my scanner/printer unit. The new scanner can also scan slides, negatives and editable documents, and much to my delight, it came bundled with Photoshop Elements 9! Not that I know how to use that software, but hey, there are tutorials on YouTube! Forget to share with u. Borderless traveler here. My real name is Simon Voon.. Try Lomo 800 as a start. Cost RM34 for 3 rolls in Malaysia . Not bad the film. Fuji Natura 1600 is pro level fine great film which cost RM33 per roll. But very good. Hey, Simon Voon aka Boderless Traveler, is it? :-) Thanks for the Lomo 800 recommendation! Never heard of that before! Definitely will let you guys know when I am in KL! KoonYik says he'll arrange a TT! Looking forward to that!